Silhouette sketch of Bhagwan Singh Gyanee, signed by Vernon. 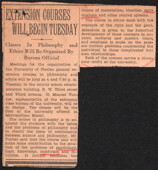 Newspaper clipping of an article describing Dr. Gyanee's upcoming lectures in Florida. Letter signed by faculty and students at the Miami School of Applied Arts thanking him for his lectures and lessons at the college and wishing him success in future endeavors.